Hosses! Bats! Eggs! No Gay Bars! – Ashgabat, Turkmanistan. We dragged ourselves out of bed after our lovely relaxing two hours sleep and on going out to the balcony with a breakfast lager bottom, we discovered the beautiful snow-capped mountain view that the darkness had hidden from us last night (from Susan and Vita’s room that is – Jill’s just had a view of a corrugated iron hut with bins of potato peelings and some cats). We headed down to the lobby, thinking we were already late, but Dima was nowhere to be seen. After giving him half an hour we decided to give him a ring to see where he was, only for him to inform us that it was only 9am – it turned out that Jill and Susan’s phones had both updated to Pakistan time instead of Turkmenistan and we were an hour early! Aye, like we REALLY couldn’t have done with that extra hour in bed!! We bought some beers for the journey from the shop at the hotel (for an exorbitant $1 each) and once Dima turned up (on time) we headed off in the car towards Alaja farm. 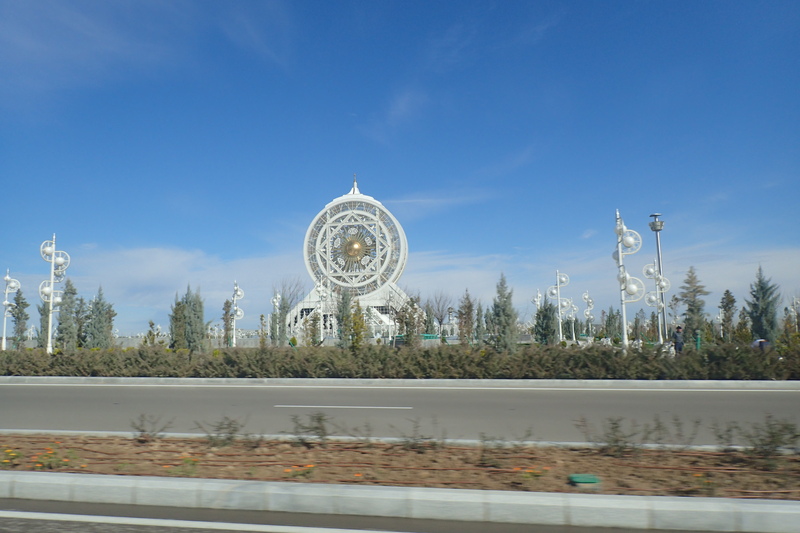 The ride through Ashgabat was interesting and Dima took us on a quick tour in the car since we had lost a day due to our flight mishaps so we wouldn’t get to go wander around and go to the amazing sounding crap theme park, Turkmenbashi Tales which we were the most gutted about! Ashgabat is a very rapidly developing city with lots of the country’s huge oil and gas profits being poured into building the grandiose, white marble fronted buildings with seemingly no purpose, or people. Even the multi storey car parks, bus stops and traffic lights were intricate wrought iron patterns, painted white and gold. For anyone interested in seeing some better pictures of the place than ours from a moving car, here’s a good article with some great photographs. The city was levelled by a huge Earthquake in 1969 which also killed 2/3 of the population, so everything is very new and clean and shiny – Dima told us that the president is so proud of his white city that he is trying to implement a new rule where only white cars are allowed! And there is a current rule outlawing dirty cars – much to Dima’s chagrin since he drives in and out of the dessert all the time. Of course, this is the country which Human Rights Watch states that “Turkmenistan remains one of the world’s most repressive countries. The country is virtually closed to independent scrutiny, media and religious freedoms are subject to draconian restrictions, and human rights defenders and other activists face the constant threat of government reprisal”. So a clean car is nothing compared to other restrictions the nation has placed on them. And this is the new “progressive” president, Berdymukhamedov. The old “president for life” who died in 2006, Saparmurat Atayevich Niyazov, self titled Türkmenbaşy (Leader of Turkmen) went so far as to rename the months and days of the week after such things as his Mother and the title of his book (the Ruhnama, a book on spiritual/moral guidance, an autobiography and revisionist history which pervaded Turkmen life so much that there were questions on it on the driving test and Niyazov was recorded as saying that he had interceded with God to ensure that any student who read the book three times would automatically get into heaven! 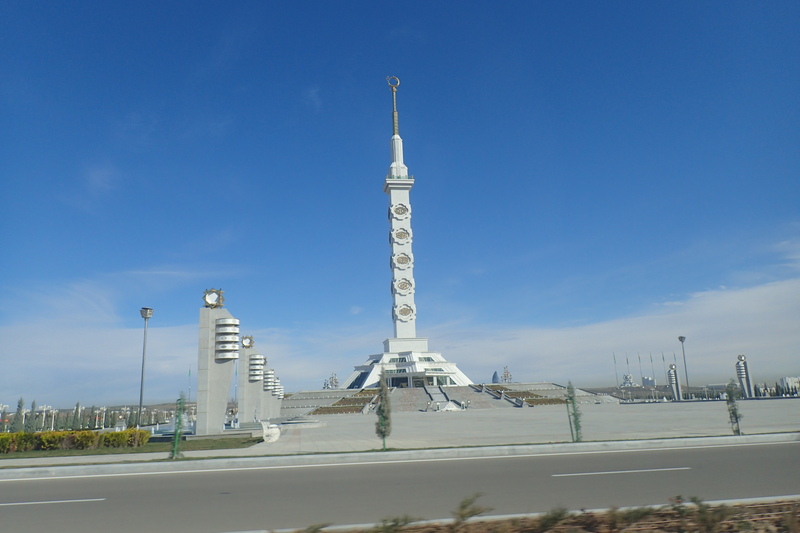 In 2004, after a government decree, the teaching of algebra, physics and physical education effectively ended in Turkmenistan and instead students were encouraged to memorize the Ruhnama and chant slogans praising President Niyazov. Knowledge of the text was required to pass education exams and to hold any state employment). Among other things he also banned the use of lip syncing at public concerts, dogs in Ashgabat, opera, ballet, and the circus (for being “decidedly unturkmen-like”), men having long hair or beards (oh no! ), and news reporters and anchors from wearing make-up on television (because he said he found it difficult to distinguish male anchors from female anchors). So to get rid of all that, yes I’d clean my car! The 95m tall Älem Cultural and Entertainment Centre contains the world’s largest Ferris wheel at 47m high. Älem means ‘The Universe’. History lesson over, we drove up to the mountains (stopping at Dima’s favourite place by a little stream, where we were wished Happy International Women’s day by a young couple out walking their chihuahuas) before arriving at Alaja farm, famous for its strong and fast Ahkalt Tekke horses – the ferraris of the horse world! The owner showed us around and welcomed us into his little gazebo where he had set the table for tea and biscuits, much to Vita’s delight as we had had no breakfast and, unlike the travellers liquid diet we usually subsist on, she likes to put actual solid food into her! Crazy. He explained how his family had been breeding and training Ahkalt Tekes for many generations and had his miserable groom bring out some of the horses to show us so we could decide which ones we wanted to ride. Getting a horse biology lesson. We weren’t aware of this fact at the time and thought we were just being shown the horses to look at with our eyes and that. The farmer and Dima were talking away in Russian, thinking we didn’t understand anything, but of course Vita being our woman on the inside understood every word and told us that he was worried about giving us three of his expensive, champion Ahkalt Teke horses to ride off into the desert as we would lose them. 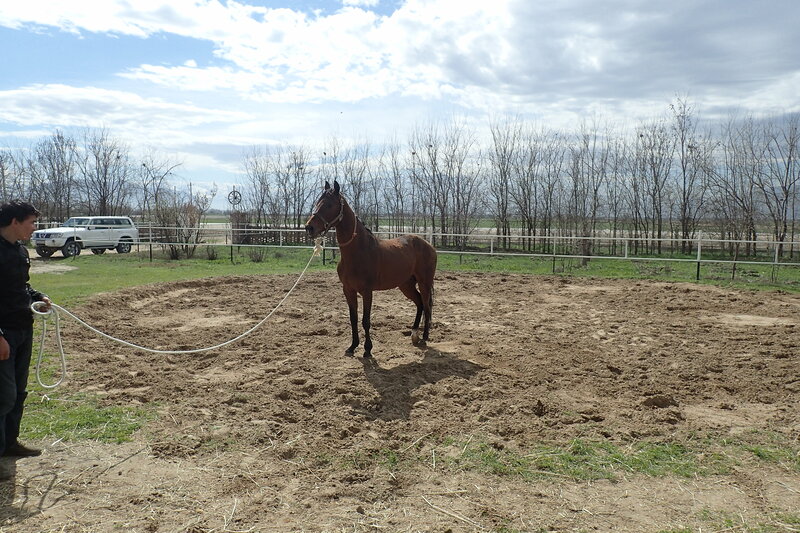 Of course we hadn’t expected to just take horses – we thought we were just going to have a little ride around the farm! So we agreed to just have a little walk around the farm on a horse called “Bandit”, which was fine for Jill and Vita as they had only ever ridden a couple of times (and all of Jill’s rides involved falling off into something spiky) but Susan was a bit frustrated at not at least being able to trot or canter and having to be lead around by the groom, but all of us understood that us being let loose in the desert on champion racehorses that hadn’t been out for a run in a while was definitely not the best idea (he did say that if he had been told in advance of us coming he would of had them exercised so we could ride them, however despite being told a month in advance of the date and time and stable we wanted to go to, our tour company hadn’t bothered to tell the stables until the day before!). Totally a real photograph of us riding through the dessert. After the farm our next stop was Kow Ata, the underground sulphur lake in a cave (which is also home to Central Asia’s largest bat colony) that is 30+ degrees all year round. We descended the loads of steep, wet and slippery steps down into the cave, with Vita panicking at the chittering of the bats in the roof as we changed into our swimming costumes on a dark, wet little platform before getting into lovely warm water that didn’t smell half as much as boiled eggs as we thought. We dicked around with with Susan’s underwater camera and enjoyed a nice relaxing soak, and left just as several huge families turned up (wishing us happy international women’s day – we were so glad to have Vita with us to translate as otherwise we would have no idea what all these random people were saying to us and probably assumed the men were just doing the Russian version of “Sho mir” (“You are very good”, always directed towards our cleveland)!) which was good timing as we’d pretty much had the place to ourselves. We got outside and joined Dima who was sitting at a table at the little cafe outside enjoying a pot of tea and a cigarette, and ordered some food and beer for ourselves. Jill and Vita got the most AMAZING shashlik and poor Susan had to have a salad but it was quite nice. The picnic tables outside were full of local families enjoying a nice Sunday afternoon out and the atmosphere was really lovely. What was not lovely however, was the dilapidated public toilet which looked like it had been hit by a puu grenade. Jill braved it as her buddha was blasting but having been given prior warning, Susan and Vita gazed at it and decided that the car ride back to Ashgabat with the danger of weeing themselves was preferable. Dima dropped us back off at the hotel where we got changed, enjoyed some vodka (which worked out about EUR 1.50) and VITA POWER energy drink (which we found hilarious and spent ages making Vita pose with), people watching everyone in their finest attire for International Women’s day and headed off into the night in search somewhere to eat that took visa card as we had spent all our manats. We had a lovely walk through the park which was swarming with local families, again we cannot stress how amazing the Turkmen women looked – THE DRESSES! THE SILKS! THE SHAWLS!!! The men put in a poor effort with their jeans or tracksuits. Dima had told us that the five star hotels had ATMs that took visa (none of the cash points would work with international cards, and all the banks were closed with it being a public holiday) so we flagged down a carpeted taxi to the Hotel Nusay (opposite the presidential palace in the Berzengi “Las Vegas” area of town – which looked lovely with all its neon lights, but was actually quite soulless with no one around), which ended up not having an ATM but took visa so we decided on having dinner and drinks there – it wasn’t our first choice as we’d much rather gone somewhere more central and authentic but due to the money situation we didn’t really have any other option! We really fancied a bottle of wine but the wine was ridiculously expensive, however for the price of two beers you could get a bottle of vodka, so obviously that was a no brainer! The food was actually really nice (Jill had some “meat dumplings in cream” which was kind of like creamy ravioli and VERY NICE, Vita had a lovely goulash and Susan got some fish). They also had a very nice display of desserts that tempted Susan and Vita to order some (while Jill just opted for a nice good clean traditional whisky digestif), and the lovely waitresses ended up coming over with a load of the desserts from the display and putting them on the table, saying they were on the house “for International Women’s Day”! And THEN brought out the desserts that they had originally ordered! We gave a good effort at finishing them but alas we were just too full, so paid the bill and then relocated to the bar down the hall, recommended by Jill who had been nipping out there for cigarettes. It was a very grand art deco style lounge with lovely chandeliers (that Vita ended up stealing one of the beads off – the Latvian troublemaker that she is!) and the bartender didn’t know what a margarita was, but he googled it and made us one – it definitely wasn’t half bad and could have only been improved by using limes instead of lemons (we have a bit of a track record of ordering Margaritas in bizarre places that haven’t heard of them and they end up tasting like nothing on earth). Nice though the hotel bar was, it was very subdued and after the huge meal we were either in need of going somewhere more lively to perk us up, or going back to the hotel and going to bed. 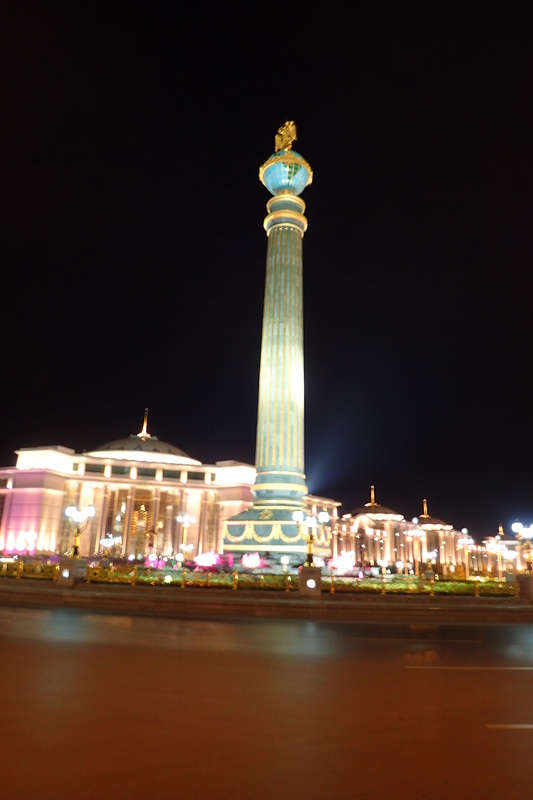 Unfortunately, since we couldn’t get any money out anywhere and only had a couple of manats to our names (and it was fairly late by this point and most places looked closed), option one was unlikely to happen, so we headed out to try and flag down a taxi back to the hotel. After wandering around next to all the grand government buildings (not seeing any taxis) we found a likely taxi-flagging spot on the corner and were standing waiting when an official looking man shouted us, blew his whistle, flagged over the next car that came round the corner and told us to get in. With the aid of Vita’s Russian we quickly established that he wasn’t a taxi driver – just a young man that had gone for a drive in the middle of the night to escape his wife (and had only stopped as the official man had told him to) but he was happy to drive us to the hotel free of charge. We’d asked if he knew of any ATMs we could use Visa or Mastercard to get money and after driving us to a few banks with no success, he offered to take us to the airport as we knew for sure that there was one there. He definitely seemed very taken by the lovely Vita! We’d even asked if there was anywhere we could buy beer, and after a phone call to his mate we ended up calling at a little shop that was shut but they unlocked the door and let us quickly dash in for some road boozes. 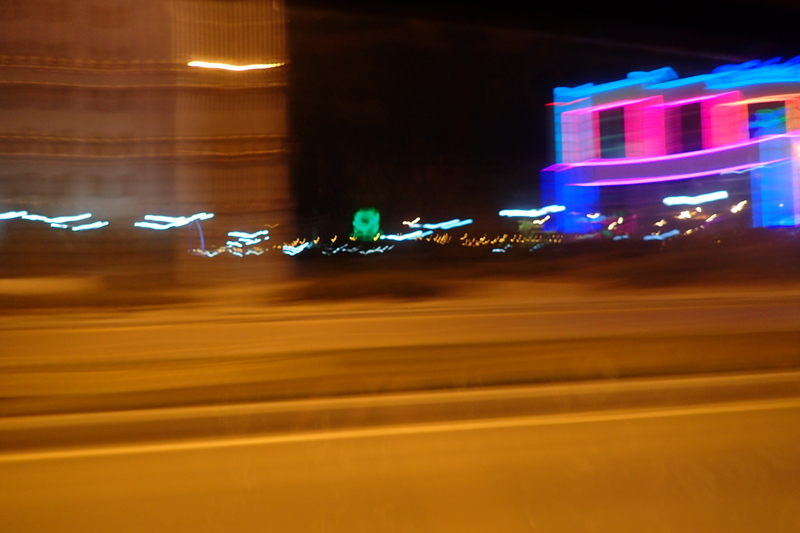 He took us on a nice night time tour of Ashgabat en route to the airport, it’s all very impressive with neon lights everywhere! And yet nothing seems to be going on! Not a gay bar (excuse wobbly drunk car photography). Also not a gay bar. We got our money out and after contemplating getting him to drive us to the casino (the only place he said was open for drinks at that time), we decided we would just go back to the hotel. He dropped us off (after attempting to smooch a non-compliant Vita) and we had a night cap on the balcony before heading to bed as we had quite an early start the next day for our epic journey to the GATES OF HELL!! Previous PostThe time of The Stans has finally arrived – or has it? Your heroines take their first pounding: Gatwick, UK to Ashgabat, Turkmenistan.Next PostThings go entirely to plan in country number 2 (warning, there’s a twist at the beginning, middle and end). Karakum desert, Turkmenistan to Nukus, Uzbekistan.